At CSD, we enjoy creating high class, custom frames for our customers that are sports fans. But we don’t just want to be known for framing sports memorabilia. We want everyone to know we can custom frame any sort of memory, relic, or picture you need. For example, students who graduate from school love to have their diplomas framed. It a symbol of not just their accomplishments but also of taking pride in the school they attended. Why not take the framing of the diploma to the next step! Throw on a custom matting with your school’s name in the cutout and add an image of your school’s campus to make your diploma standout even more. People should be proud of their accomplishments and have them hanging up proudly! So when it comes time for you or your child’s graduation, be sure to take pride in achievement and create a custom designed frame for your diploma to show it off. We know friends, family members, and co-workers will be looking at your diploma wondering where you had the framing done. 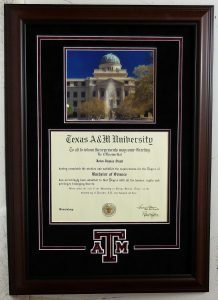 To start custom framing your diploma or anything else you are needing to have framed, visit us online at https://www.csdframing.com/ and good luck to those of you on the brink of graduating! This entry was posted in entertainment, Events, Framing, Home Decor, Memorabilia and tagged Custom, custom framer, custom framing, diploma, frame, gift, graduation, school, university.